This is one of those posts I hesitate to write because this may already be common knowledge. But, I just polled a couple people and asked them if they knew about this, and both of them looked at me like I had horns. So. At the risk of being redundant, I am sharing this one. No recollection where I learned this trick, but I use it once a month or more (yes, I hang a lot of pictures). 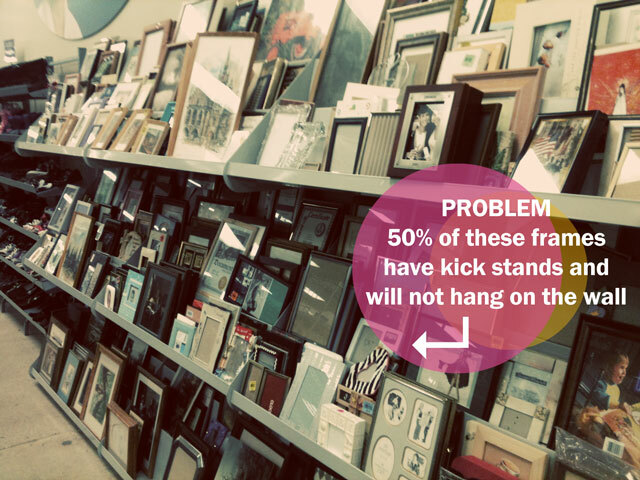 I sort of assumed everybody knew about it, and yet, I always see people trolling the thrift store frame section and flipping each frame and looking for brackets and hangers. If they only knew…. I left some tails on the ribbon because I like to see it peeping out the top like bunny ears, but you could certainly skip that part. I get it. Not everyone likes bunnies. 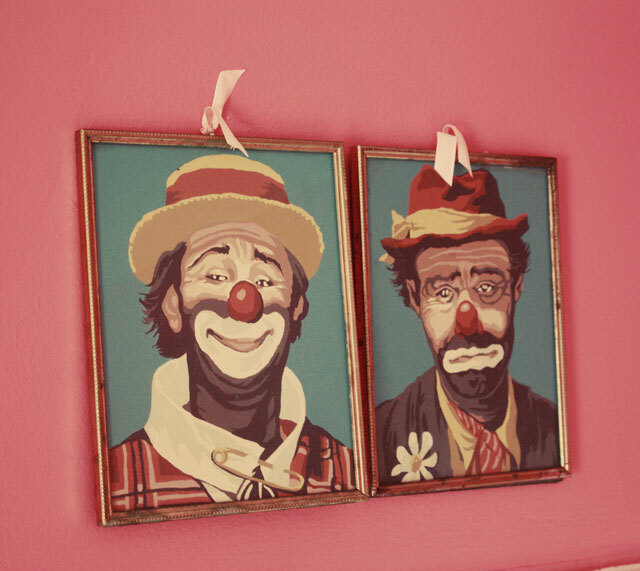 These clowns hang over my kitchen door. The one on the left looks a little like Columbo. Then again, so does the one on the right. That Peter Falk knew how to get around. Oh Snap! I did not know this. How foolish of me. Genius idea! I just felt like saying “duh” after reading your post. It’s such an easy fix – thanks! Nope, never heard of this before. Yep, this is GENIUS!!!!!!! Thanks for sharing even tho you thought we might already know this!!! You ROCK!!! Geesh, I can’t believe I didn’t think of this! I have 4 small cheap dollar store frames I was hanging with sticky tack and they all fell down, lol. Thank you so much for sharing this! Great idea! Thank you for this!! You’re right some people might not know those simple tricks that make thrifting a cheap decorators dreams come true! Did you knoa that Peter Falk was a painter? Mostly watercolor I think…I would like to have one of his paintingg. Just more thing(channelling my inner Columbo) I love Coumbo! OMG!!! Those guys would scare me to death in the middle of the night. Holy crap…genius. Also, those clowns are horrifying. Well not everyone knew it because I didn’t. Great idea. LOVE IT! and no, I never knew it either…but I have seen those other little clips that you have to nail onto the back of the picture frame with eensy weensy nails that are almost invisible – that you hit your finger if you try to use a hammer. This is much friendlier and less damaging to your fingers. I like the bunny ears too. How did I not know about this? This is great information. oh my gosh! I did not know this either. doh! Now I can actually hang those flamingo pics in my dining room! More flamingoes belong in dining rooms. Always. If you had polled me, I would have looked at you like you had bunny ears. didn’t know this one – love it! Sometimes the simpliest things are foreign! Thanks for this idea!! I also hadn’t really considered this idea! I have some cheap dollar store frames that I had leftover from decorating for a party a few years back. I was REALLY resisting attaching the saw-tooth hangers because I knew it would be a pain to do for 8 frames….this is my answer! The cardboard “hangers” that were originally attached to the backing have been ripped for ages, nothing like getting ready for a party that inspires me to fix them up. Thank you for the tip! Thank you so much! This is REALLY helpful! Any tips on what to do if your frame has a velvet/felt fabric back and you are unable to cut through it? Actually, yes. Sorta. It depends on the thickness of the backing (assuming it’s still thick cardboard or thin wood/similar). But okay. 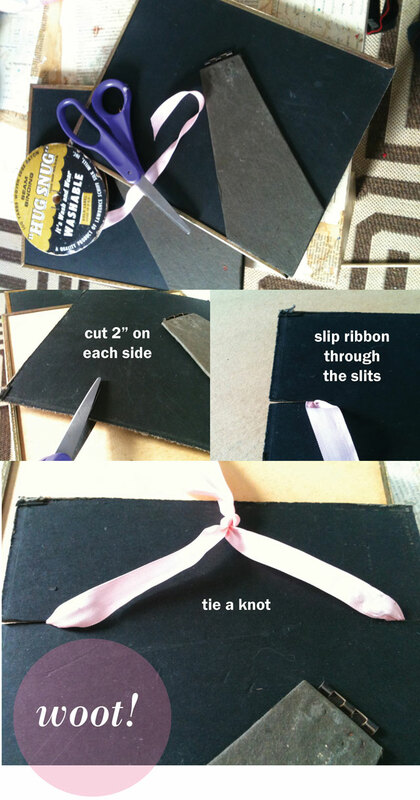 So, you take the backing off then use a piece of string to tie around it as though you were wrapping a ribbon around a very thin present (one up – one down, bow in the center). Double knot the bow and slip it back in place — you can now use the horizontal string to hang from. Hope that helps! Thank you for this tip!! I was going to try Command Strips, but I was nervous about them sticking to the the velvet texture on the backing. This is an amazing idea, I hung my picture so quickly thanks to this! Perfect solution for what I was looking for. Thank you. Freaking genius!!! I just spent almost an hour googling how to do this and was considering buying four new frames I was so frustrated! Your blog is the only technique that would work on the frames I have. THANK YOU… This is a game changer!